F. Sehnaz Bac is celebrated for her radiantly colorful and charming painted stones, which she sells on Etsy as I Sassi Dell'Adriatico (The Adriatic Stones). Sehnaz has more than 450,000 Facebook followers. She lives in Alba Adriatica, Italy, a small town on the Adriatic Sea. Marisa Redondo works primarily with watercolors and oils and is fascinated by nature's creations and the little pieces of life that often go unnoticed, from the fine lines of feathers to the spores of a dandelion. Through watercolor she explores the organic patterns and intricate details impressed on everything from the earth. Learn more at www.riverlunaart.com. 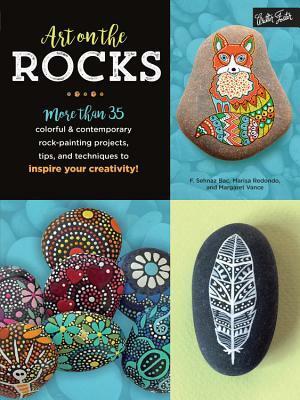 Cassandra's Review- I really enjoy the 35+ ideas and instructions included in this book to help even a beginner, paint on rocks. it is fun and medium hard to do, but is a cool project for the kids.